Reacting to the growing influence of his eastern provinces, the first Constantine, Emperor of the Romans, formally shifted the governance of the Roman Empire from its namesake city to the small Greek port at Byzantium. The town, which quickly grew into a city rivaling its Italian predecessor, was renamed Constantinople, and over the next centuries the empire's authority slowly shifted from west to east and from Latin to Greek. Straddling the crossroads of Europe and Asia, Constantinople grew into the largest and most important city of the vast empire, a cosmopolitan marvel that controlled trade and politics across numerous cultures. Those days are long past however, and now Constantinople stands as a final bulwark between the people who claim to be the Roman Empire and those who claim to be its inheritors. The Roman Empire has now been divided both politically and geographically for many centuries, and its numerous provinces have been abandoned and conquered over the long years, leaving an emperor whose power hardly reaches beyond his city walls. Though the Patriarch in Constantinople is unchallenged as the center of Orthodox Christianity, this eastern branch of the faith commands little in the way of martial or political power compared to its Catholic counterpart. The last remnant of this Greek empire, claimant of ancient authority over the Mediterranean and all the lands from Brittania to Mesopotamia, seems destined to be engulfed in the growing power of the Ottoman Sultanate and thus establishing this Muslim nation's hegemony over Rome's legacy. Basileus Ioannes, of the esteemed Palaiologoi, ruled his realm with full knowledge that the Ottoman Sultan could take his domain from him at will and most likely would. Distractions by other matters of foreign policy kept the Sultan and his soldiers at bay, but Constantinople would eventually top the Ottoman list of military priorities. Ioannes was not yet resigned to his people's apparent fate, however, and desperately searched for allies from abroad. The powerful Christian nations of Europe, demoralized from their recent defeat by the Ottomans at Varna, refused to aid the Greeks, but a singular opportunity arose as the sultan moved to subjugate the Albanians. Though he despised the Venetian Republic and its past opportunism at the expense of the Greeks, Ioannes was pleased to see the Italians attempt to halt Ottoman expansion towards their domains and meet with initial success. The basileus chose to throw in the last of his military might in support of the Albanians and their Venetian protectors in a final gambit to thwart the Ottomans. Further victories accumulated for the unlikely alliance and the combined fleets of the Venetians and Byzantines wrested control of the Aegean away from the Muslim invaders. Seizing onto this momentary weakness, the Sultan of Egypt attacked his Ottoman rival from the south, causing the immediate withdrawal of all Ottoman forces from Europe. Ioannes, aware that this may be his realm's only chance, ensured his soldiers were present to enforce his claims on the cities of Greece and Thrace before the Venetians could do the same. Though this risked discord among the Christian allies, it did not prove detrimental to their progress. When the Ottomans agreed to peace with Albania and its allies, their Macedonian and Thracian holdings, including their newly celebrated capital in the ancient city of Adrianopolis, were returned to the Greek emperor. Shortly after, the sultan of Egypt further weakened the Ottomans by forcing them to return Epirus and Thessaly as well. With Greek authority restored in Greece, the Italian rule of Athens quickly grew unpopular. Basileus Konstantinos saw his rule as a rebirth of his empire, saved from the brink of ruin by the political acumen of his father and the bravery of Constantinople's soldiers, and believed their had never been a more suitable time to change the old ways of governance in the face of a new world. Grasping onto new ideas from both Europe and the Middle East, he wished to centralize political power in Constantinople and replace the local factionalism that had led to much of his people's strife with a unifying nationalism. Though they resisted their loss in power, the foreign nobles of Athens recognized their situation and the shift in public support. Eventually compromises were reached that restored Athens to direct imperial governance to celebrations throughout the realm. With Ottoman authority effectively removed from the Balkans, the king of Serbia had conquered much of Bulgaria from the weak regional government, but Basileus Konstantinos believed that the Bulgarian people were rightfully subjects of Constantinople. Supported by the Prince of Wallachia, rival of the Serbian king, the basileus led his armies into Bulgaria and clashed with Serbian forces across the countryside. The Byzantine army was victorious at each engagement and, as they moved into Serbia, the enemy king turned over his Bulgarian holdings to the basileus. In the past, the aristocracy of Constantinople had looked upon the Slavic people with derision and disdain, but Konstantinos pragmatically recognized that this neighboring population could almost match the taxation base and manpower of his Greek base. While he harbored no doubts regarding the superiority of his people, he was aware that ostracizing such a significant portion of his subjects ran counter to his reform of imperial systems and spent every effort in promoting Bulgarian participation and acceptance throughout his realm and even brought in Bulgarian advisers to his own council. This would come at the expense of his legitimacy among the Greek nobility and threaten the inheritance of his son, but efficiently incorporated the Bulgarians into the imperial administration and military. The first test of Konstantinos' new administration came as the Ottomans attacked the Christian kingdoms of Trebizond and Georgia. As allies of these eastern kingdoms, similarly threatened by the Ottomans, the basileus invaded the Ottoman domains from the west with the public support of the Patriarch, who commissioned and unveiled a new icon of St. Micheal in the Hagia Sophia, a clear symbol of God's protection over the basileus' soldiers. In the eastern mountains, the Ottomans defeated the defenders but at bloody cost and were unable to challenge the occupation of their remaining holdings in Europe by Byzantine forces. When the the Byzantine commanders crossed the Sea of Marmara and captured Bursa, the Ottomans were forced to retreat from Georgia in order to attempt to reclaim their new capital. The combined Ottoman forces defeated Konstantinos' army, which was forced to retreat back across the sea, allowing the Ottomans to besiege the captured castles at Bursa and Nikomedia. 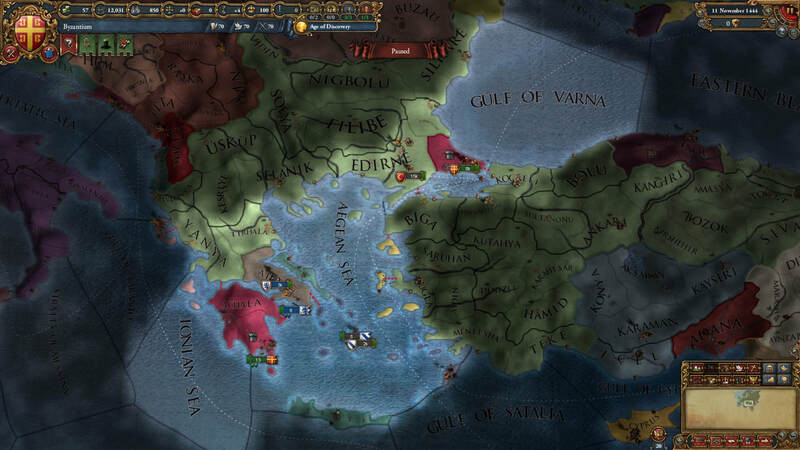 Wary that the Venetians and Serbs were plotting to attack Greece at any sign of weakness, Basileus Konstantinos agreed to return Bursa to the Ottomans and withdraw from the war in exchange for all other lands currently held by the Byzantines. Official Ottoman authority was thus completely removed from Europe and Nikomedia reclaimed for the Greeks, but Trebizond was eventually forced to submit to Ottoman control. Determined not to allow further Christian loses in the Caucuses, Konstantinos committed his soldiers to defend Georgia against the warlords of the Qara Qoyunlu. Battles raged across the mountains with little captured by either side but extensive military losses for both sides. A rebellion organized by Turkish parties in Optimatoi forced the basileus to withdraw his battered forces to Constantinople for many months, but he returned to support the Georgians within a year. The war left Konstantinos' commanders desperate for new recruits, but the king of Georgia was able to finally exhaust the will of the Qara Qoyunlu and assert claims over many disputed border provinces. Konstantinos' son and heir was widely thought to have an unnaturally affinity for progressive ideologies and foreign cultures and, at his father's death, a portion of the nobility and military rose up against him in support of a more distant claimant to the throne. Nikolaos Boteneiates personally led his supporters as they captured the cities of Sofia and Kastoria, while Basileus Andreas tried to rally his army at Constantinople. Andreas' army was not restored from the bloody Georgian war, and defeating Nikolaos' rebellion required the new basileus to empty the imperial treasury for the hiring of foreign mercenaries. By the time Nikolaos was defeated, the imperial army was in a sad state. Unfortunately, there would be no time to recuperate, for the Ottomans sensed Constantinople's weakness. 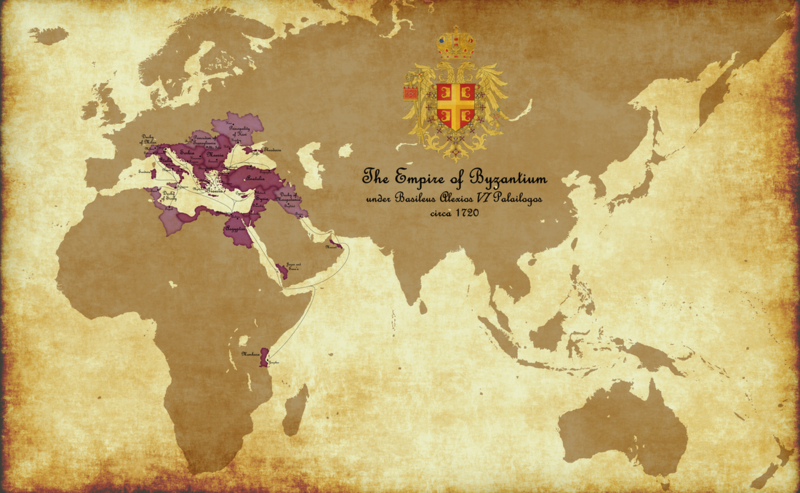 With their efforts supported by the powerful Aragonese kingdom and the basileus's calls to arms to Georgia and Wallachia ignored, the return of the Ottomans to Europe looked likely. Fortunately the duke of Milan and the Prince of Smolensk proved eager to show their support against the Muslims and brought armies to support the tattered Byzantine regiments, while the distant Aragonese initially sent only their admirals to support the Ottoman invasion. The Byzantine fleet lost the initial engagements in the Aegean and withdrew to the Sea of Marmara and the protection of the Golden Horn, but the imperial army supported by their foreign allies and thousands of mercenaries were able to cross the straits and defeat the sultan's forces outside the city of Nikomedia. They then quickly captured Bursa once again as well as the eastern coast of the Aegean. With the Aragonese army finally approaching the borders of Bulgaria, Andreas eagerly agreed to peace when the sultan offered him the castles and trade ports of Sugla in exchange for withdrawal from his capital. Perhaps the basileus could have defeated the separated enemy forces and pushed the Ottomans further into Anatolia, but the blockade of the Aegean, the depopulated countryside, and the mounting debts of the imperial treasury demanded a swift end to the war. Though he had witnessed the fickle nature of Wallachia's prince, Basileus Ioannes found him more than willing to commit his soldiers to war against his princedom's neighbors. Ioannes desired the castles of Bessarabia in order to control access to the Danube and steer trade goods through the port of Constantinople, and saw an opportunity to weaken any threat from the Serbian kingdom simultaneously. As the armies of Wallachia struggled against the prince of Moldavia, the imperial army captured the seat of the Serbian king before moving to take Bessarabia and rout the Moldavian army. Serbia left the war disgraced but intact, but Moldavia was given to the Draculesti of Wallachia, excepting Bessarabia, which was quickly incorporated into the empire. When the Venetians came for Athens, the Draculesti once again ignored Constantinople's calls for aid, but the Byzantine army rebuffed the disorganized attempts of the Italians to cross from Corfu into the mountains of Epirus all the same. Though the republics possessed frightening naval power, Ioannes's admiral was able to engage overconfident Italian fleets piecemeal and win control of the Adriatic as byzantine forces slowly captured Corfu, and the many Venetian islands of the Aegean. The basileus' allies in Theodoro had occupied Genoa's holdings on the Black Sea, and the Genoese Republic agreed to abandon their Venetian allies in exchange for their return. Left alone and under an embarrassing blockage. 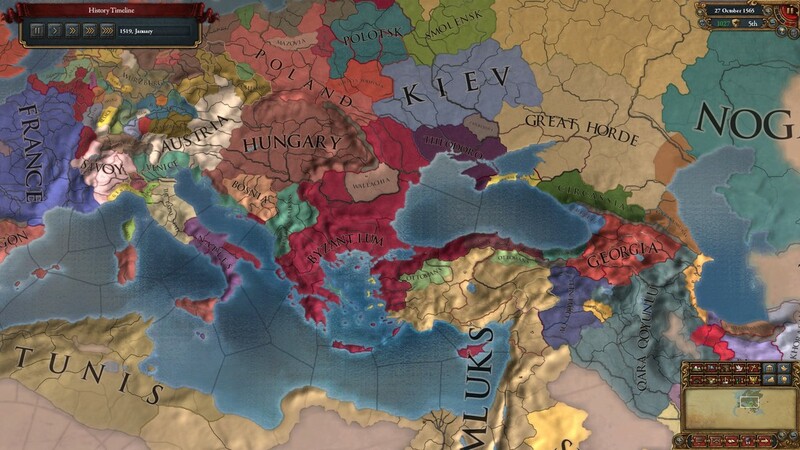 The Venetians officially relinquished Corfu and Crete to the basileus. With the return of Corfu and Crete to Greek rule, Basileus Ioannes organised the first Triumph of his reborn empire to recognize his people's success and reassert their cultural connection to the empire of old. A great icon of St. Nicholas was unveiled at the Hagia Sophia by the Ecumenical Patriarch with proclamations of God's ancient sanction of Constantinople's rule over all the lands of the Mediterranean. For many, it was clear that Basileus Ioannes was laying the foundation for an extensive military campaign. The Ottomans had recently suffered further defeats by the Mamluk Sultanate, and Basileus Ioannes invaded Anatolia knowing resistance would be weak. 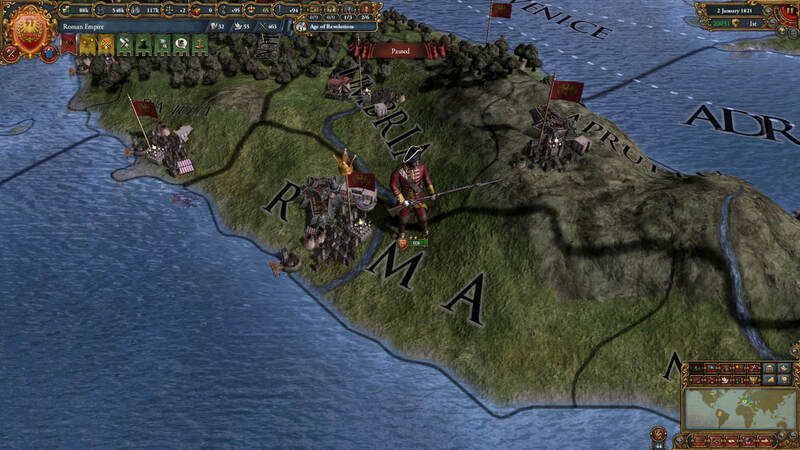 Ioannes was secretly pleased to see the merchant princes of Ragusa support their Ottoman protectors, and gladly sent his fleet to demolish the Ragusan ships and his soldiers to besiege the city. 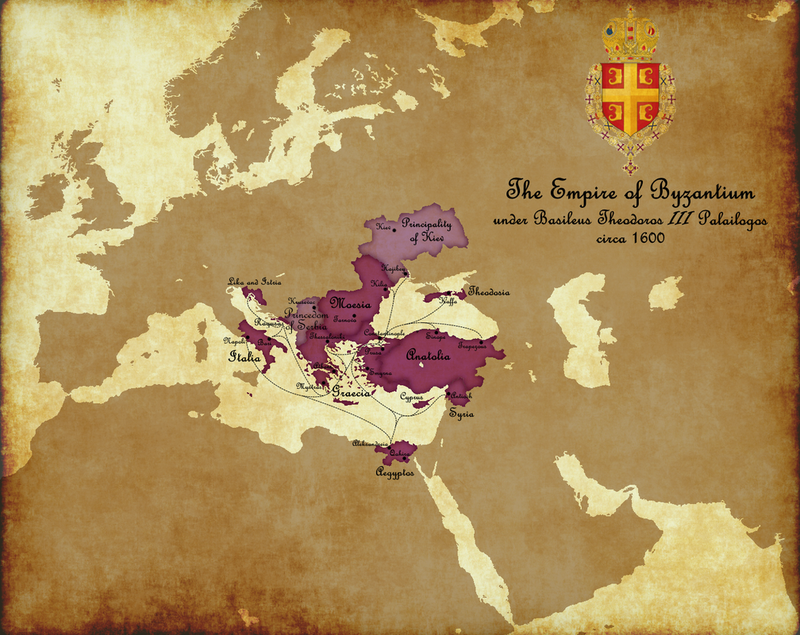 Despite its distance from his borders and the anger of the various Italian and Balkan states, the Basileus audaciously declared Ragusa part of his empire and its merchants would no longer work against Constantinople's interests. In Anatolia, the Byzantine commanders captured Bursa from the Ottomans for a third and final time, as it would not again be returned. As his army was routed and his cities captured, the sultan of the Ottomans turned over almost all his remaining coastal holdings to the Basileus. The Venetians had invaded Serbia and now controlled the majority of the kingdom, but Basileus Ioannes IX planned to protect the rest of Serbian land from the Italians by eliminating the problematic Serbian monarchy and bringing the Serbs into the empire. Before he could enforce his will, however, he was overtaken by illness and died. His son, Ioannes X, ready and able to follow his father's first successful steps, easily defeated the Serbian army and its Kievan allies, and both would be brought to swear allegiance to the basileus. The Ruthenians of Kiev, recently emerged from the dissolution of the Grand Duchy of Lithuania, were similarly vulnerable to expansive neighbors, like the Serbs, and the new Basileus granted them imperial protection and support in return for submission to the imperial throne. The king of Cyprus had fallen from favor with the Mamluks and his diplomats now sought protection for their kingdom from Constantinople. Basileus Ioannes had been well educated in his predecessors past mistakes regarding the assumption that the Catholic Franks respected Constantinople's divinely ordained supremacy, but sent his soldiers to the island nevertheless. When they arrived, they imprisoned the island's administrators and besieged the king in his castle. Soon afterword, the islands Greek inhabitants were once again subjects of the emperor. Basileus Ioannes supported the prince of Theodoro in a campaign to expand his territory at the expense of the weak Catholic kingdoms that reigned over the Orthodox Ruthenians. The Polish kingdom had been engaged in war with its neighbors for many decades and had little resources or will to defend its southern holdings. With imperial support, the prince of Theodoro's control over the Crimeans greatly expanded. Though he had hoped the rising rulers of Muscovy, fellow followers of the true faith, would be great allies to Constantinople, it was becoming clear that their ambitious nobility had designs on the the Black Sea region and were competing with the Byzantines for influence over the smaller states of Georgia, Theodoro, and the many Russian princedoms. Following up on their strong presence in the north, Basileus Ioannes sent his commanders against the duke of Chernigov, the southernmost of these princedoms. By force, Chernigov would be subjected to rule from Kiev, extending the Basileus's control over the region, but further offending the upstart Muscovites. As the Draculesti had shown themselves to be enemies of Constantinople during the reigns of his uncle and father, Basileus Ioannes decided to bring Moldavia under imperial protection at the behest of the Vlach clergy and nobility. With his castle occupied by imperial soldiers, the prince of Wallachia learned that his independence exists at Constantinople pleasure. Constantinople had not executed a successful campaign in Italy since the time of Basileus Justinian, and the Greeks had been unable to defend their interests in the region from the Normans, Arabs, or Catalans, but now a weak monarch ruled southern Italy from Naples and foreign interests had temporarily withdrawn from the region. Unwilling to ever lose control of their seas again, the Palaiologoi and Constantinople's merchant princes had invested heavily in the city's fleets and Basileus Ioannes was confident in his ability to once again supply an imperial military presence in Italy. The invasion easily captured the western coasts and besieged the castle in Lucania. After its capitulation nothing stood between the imperial soldiers and the king of Naples but his city's walls, and so the king agreed to cede half his kingdom to the empire. For the first time in centuries, the symbols of the Roman Empire were visible over the ports of Bari and Taranto, emblazoned on imperial flags and pennants. The Venetian Republic, supported by many strong Catholic kingdoms continued to thwart and subvert Constantinople's authority in the Mediterranean and still held many of the Greek isles and much of the Serbian Balkans, both rightfully within the domain of the Byzantine Empire. 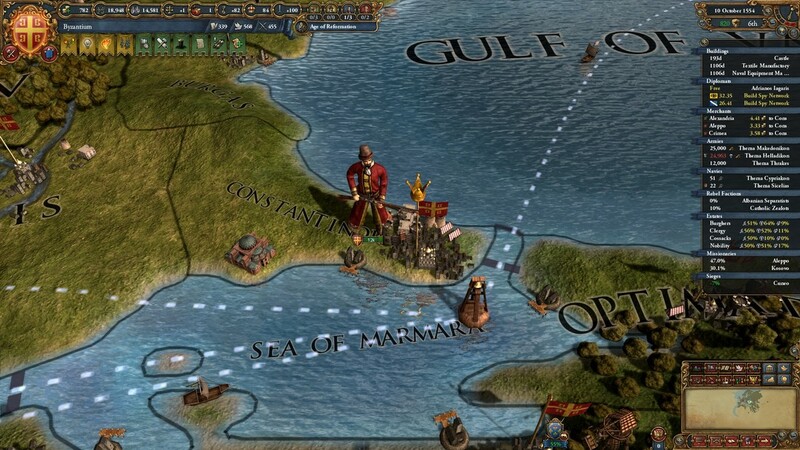 When his diplomats informed him that the Knights of Rhodes had fallen out with the Venetians, Basileus Ioannes quickly dispatched his admiral to blockade the island and seize the monastic chapter's defenses. 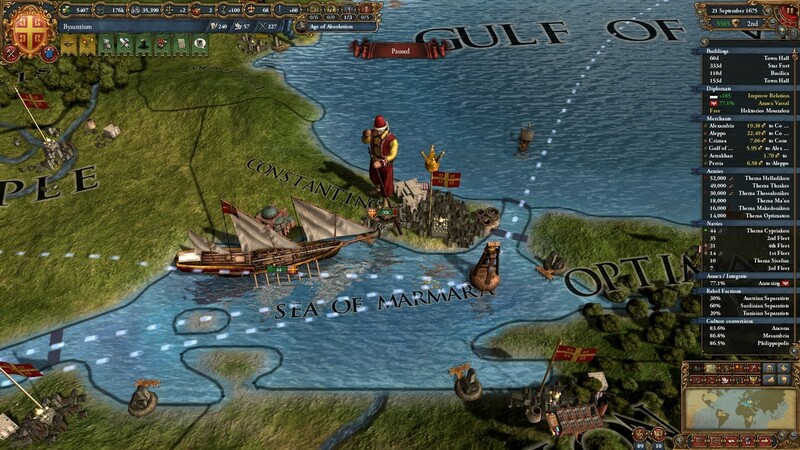 The knights had been allies against the Ottomans in the past, but their piracy had spread to imperial interests as the empire had increased its influence. Now it was clear that the knights were a liability and Rhodes must be returned to the Greeks. Though the Muslim rulers of Candar had been friendly to Byzantine interests in Anatolia, Basileus Andreas saw that Sinop and the northern coasts could easily be returned to Christian hands, specifically his. Before the Mamluks or Ottomans could extend their own dominance over the beylik, Andreas's commanders occupied Sinop and imprisoned or exiled those who resisted its annexation. They Bey of Candar called the Khan of the Great Horde to his defense and his armies clashed with Byzantine and Kievan soldiers east of the Dniepr. The Basileus' brother and heir, Prince Romanos was killed in the fighting, but the Great Horde was decisively defeated and forced to abandon their allies. Seeking allies against the powerful Mamluk sultan, the Basileus had forged ties with the Austrian archduke, called Emperor of the Romans by the unenlightened Germans and Franks. This saw Constantinople pulled into the many conflicts of central Europe, but granted opportunities for Andreas to turn against the Genoese who had ensconced themselves in formerly Greek holdings. In recognition of his support, the islands of Chios and its neighbors were turned over to Byzantine authority by the Austrian emperor. Aware of the fragility of their own state, the nobles of Trebizond eagerly accepted the protection of Constantinople in exchange for their fealty. Estranged from the ecumenical patriarch, Coptic traditions had taken prevalence in Trebizond over the past decade, but Basileus Andreas quickly forced their clergy to align with the Orthodox faith. In Europe, the Basileus's army returned to Wallachia to complete the removal of the local monarchy and cement Byzantine authority. More troublesome than the defiant Draculesti and their northern allies, however, was the simultaneous revolts of the Catholic communities on Rhodes and Chios. The pacification of the islands required the transport of well over ten thousand soldiers across the Aegean, followed up by definitive support of the local Orthodox clergy. Furthering his claims on Apulia, Basileus Andreas continued to take advantage of a weak and unsupported monarchy in Naples to extend his grasp in Italia. Intent on maintaining this foothold, the Basileus followed the invasion with the construction of fortifications along the hills of Lucania. Weakened by a series of losing wars, Genoa was unable to resist a swift Byzantine occupation of Caffa. As the Basileus's commanders landed troops along the blockaded Ligurian coastline, the Genoese agreed to abandon their final strongholds beyond Italia. Though his record of conquests were impressive, and guaranteed Basileus Andreas fame outlasting his reign, he had avoided risking war with Constantinople's true rivals in Cairo for as long as he had ruled. However, this had not gone unnoticed by his subjects, supporters and detractors. As Mamluk control over the Turks of Anatolia became more entrenched, the powerful throughout the realm clamored for the Basileus to challenge their hold over these provinces, considered valuable economically, strategically, and culturally. Though against his better judgement, the Basileus risked all he had built by ordering war brought to the Mamluks with only the scarcest of allies at his side. The naval battles along the Egyptian coast turned quickly in favor of the Byzantines, but the fight on land was a slow process of sieges and carefully maneuvered engagements. Though it taxed the imperial treasury, the Basileus's commanders relied greatly upon mercenary regiments to fill the gaps as imperial recruiters struggled to replace the inevitable losses from battles and disease. Eventually, imperial soldiers crossed the Sinai Peninsula into the heart of Egypt, a good sign that Cairo's resistance was nearing an end. The Mamluk sultan was forced withdraw from most of Anatolia's coastal settlements and return the ancient city of Antioch, lost to Muslim conquerors in 1084, to Constantinople's authority. After occupation by the Byzantines one decade ago, the republic of Lucca had officially converted to Orthodox teachings and its clergy adhered to the authority of Constantinople instead of Roma. This quickly brought the city-state into conflict with its Italian neighbors and the city naturally looked to the Basileus for assistance. From his holdings in Apulia and Calabria, Basileus Andreas led his forces north to confront the Catholic aggressors under the flags of Milan and the Papacy. Byzantine forces decisive defeated Lucca's enemies and quickly captured Roma itself, but Basileus Andreas was killed outside the city's walls, ending his long reign. His crown passed peacefully to his son and heir, Andronikos, who capably finished the war in Italy, securing the safety of Lucca. His father's defense of the Orthodox church abroad had done much to enhance the prestige of the Byzantine throne and was a precedent that Basileus Andronikos intended to embrace. The fate of the Serbs had been a frequent matter of debate at court in Constantinople, where the exiled Patriarch of the Serbian church pleaded for assistance, but the Venetian occupation of Serbian lands had strong backing from France and Aragon. Though the Venetians were hated by the populace, perhaps even more than the Turks whose communities had become increasingly integrated into Byzantine society since the fall of their Sultan, the majority of those in power resisted such an uncertain war given no immediate threat to Greek borders. However, Basileus Andronikos saw a great opportunity to pit the western powers against each other and profit from the conflict. Fomenting popular unrest against the Venetians, Andronikos pressured his nobility into line, and invaded the Serbian provinces and quickly seized the region's forts along the Adriatic. The Byzantine navy defeated the Aragonese and French ships in the Mediterranean, protecting access to Byzantine holdings in Italia, and the war's greatest violence was relegated to the German princedoms between Andronikos's Austrian allies and the French kingdom, as the Basileus had predicted. A few years of war shifted perceptions away from Venetian hegemony in the Balkans, depleting French and Aragonese support, and eventually the Venetians were left to stand on their own, quickly collapsing. 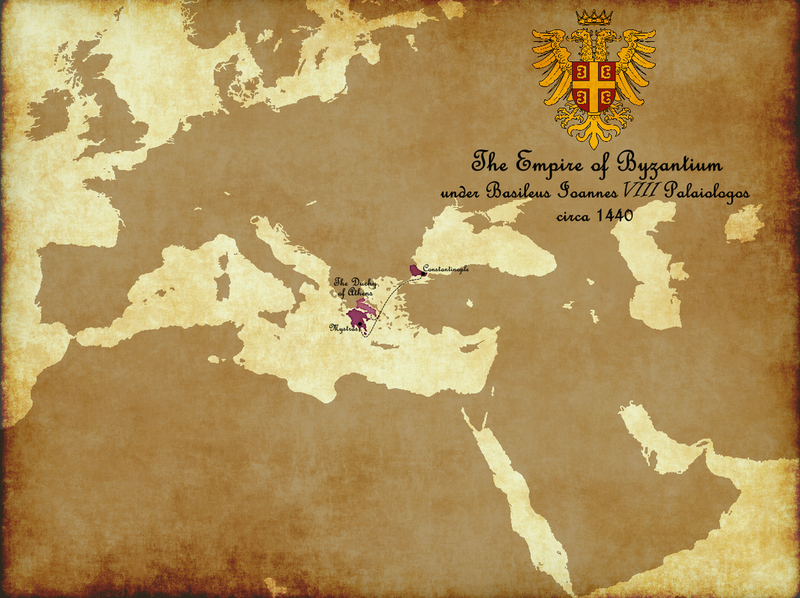 Basileus Andronikos reinstated the Serbian kingdom, under a new dynasty, sympathetic to Constantinople's aims and client to imperial rule. The return of authority to the Orthodox church in Serbian lands was quickly followed by demands that its range be extended over old communities worshipers within the Bosnian kingdom, a Catholic monarchy. Strengthening their Serbian vassals and the Orthodox church had obvious advantages and the Bosnian king capitulated to the region's new political order. Andronikos's reign saw the Byzantines turning on former allies over boundary disputes. The Gothic realm of Theodoro had profited from Constantinople's resurgence and claimed much land from the Crimean horde, sometime allies of the Ottomans, but was using their control of the Black Sea coastline to undermine Constantinople's trade monopolies. Caught between Constantinople and Muscovy, Basileus Andronikos knew that the lesser Christian rulers between the two growing powers would seek to use one rival against the other as benefited their ambitions. Before the Muscovites could insert themselves into Theodoran politics, the Basileus's commanders ensured that the Goth's understood their role under his sphere of influence while annexing the towns around the mouth of the Dnieper River. Both the Greek nobility and the Turkish statesmen in the Byzantine government desired to reclaim Anatolia for the empire, and shake off Mamluk authority over the region while it was still fragile. Turkish rebellions plagued Mamluk Anatolia, but the insurgents desired the return of the Turkish Beys, an alternative equally unattractive to the Basileus. To undermine Papal supremacy in Italia, Basileus Thomas supported dukes of Brandenburg in Austria as the ideological struggle that had taken root throughout Europe turned violent. Though the Catholic emperor held very little military might, he was supported by many of the strongest monarchies abroad. After years of widespread slaughter across the Italian and German countrysides, the Peace of Bern determined that the titles of emperor and elector could only be held by protestant rulers and the duke of Baden resigned his claim to the imperial mantle. The electors chose the duke of Brunswick as the first protestant emperor, opting for a weak imperial authority, but the powerful state of Brandenburg would not likely be denied the title for long. The wealthy city of Naples still claimed independence, lodged between the Papal and Byzantine realms, but Basileus Thomas finally completed Constantinople's conquest of the southern peninsula. With Roma now only a handful of miles away from imperial borders, the prospect of claiming the ancient city, birthright of the Byzantine people, did not appear unreasonable. Called to honor an alliance against the Venetian merchant princes, Byzantine forces occupied Istria and the Dalmatian coast and blockaded their access to the sea, cutting off their only advantage against their powerful northern neighbor. Utterly defeated on land and sea, Venice was annexed by the Austrian duchy. Despite the distracting political affairs of the western realms, Basileus Thomas had planned to turn his attentions east for over a decade. When the old treaties with the Mamluks finally expired, the Byzantine army was ready to renew the campaign for Anatolia. The region, remote from Mamluk strength, was quickly occupied and the war carried to the Levant. Damascus suffered much of the fighting, changing hands multiple times as the Mamluks sought to prevent reinforcement of the Byzantine push towards the Nile River. Once the defenders of Cairo fell however, the Mamluk sultan gave up all claims to Anatolia. Any hopes of reconciliation with the Austrian monarchy were crushed when the Habsburg Archduke and Emperor Manuel supported opposing factions in the resurgence of northern Italia's religious conflicts. While the Italians fought each other around Lucca, with the Genoese eventually occupying the city, Greek and German armies clashed in the Carpathian Basin and in the foothills of the Alps. Emperor Manuel was victorious, and forced his northern neighbor to accept terms of peace, before marching west to liberate Lucca and assert the growing Orthodox authority in Italia. Though attacked by a much weaker alliance backed primarily by the Papal State, Lucca was again forced to call on Emperor Manuel for aid in the city's defense only a few years after the latest cessation of hostilities with its neighbors. This war saw the emperor's armies raise the imperial banner above the gates of Rome, but his generals were required to return the city to its Catholic rulers after the war ended. Manuel III's unexpected death led to three years of internal political strife and paralyzed foreign policy until his nephew was old enough to grasp the throne's authority. The regency council maintained stability within the realm, but little more. After his dismissal of the regency council, Theodoros followed the guidance of his favored generals and unleashed the imperial armies on the weak and disjointed realm's to the empire's east and south. The nomadic tribes of the Armenian Plateau were easily swept aside and the region of Erzurum was finally returned to imperial rule. Immediately following the subjugation of the Coptic Qoyunlu tribes, Theodoros's soldiers engaged their Muslim counterparts again as they expanded his rule over the small Iqta of Dulkadir, a separatist faction from Mamluk rule. The imperial armies, now a diverse force recruited from Greek, Bulgarian, Vlach, Italian, and Turkish regions, ventured far into the mountains of the Qara Qoyunlu, capturing Tabriz and other major population centers after a series of successful engagements. Though they withdrew from the area after the war, the power of the Qara Qoyunlu appeared irrevocably broken. Prompted by overwhelming popular support from the clergy, nobility, and merchants alike, Theodoros turned his military momentum south to assert his empire's ancient claim on the Nile Delta. The Mamluks were still a powerful force in the region, and though Theodoro's armies outmatched those that the Sultan could field in both number and armament, the invasion would not be without substantial risk. With many key battles won around the strategically vital forts at Aleppo, Damascus, and Jerusalem, the war tilted in favor of the emperor early on and was cemented by the capture of Aleksandreia and Al Qahirah. This center of Mamluk rule was annexed by Theodoro and his rule would be defined by the reestablishment of Greek rule over Lower Aegyptos. At his death, Emperor Theodoros III was popular for his victories abroad and glorification of the Orthodox Church, and his empress had little trouble securing herself as regent for young Emperor Theodoros IV. Reigning as regent for as long as her husband had reigned as emperor, Empress Zoe consolidated the expanded resources of her late husband and directed the Byzantine generals in her own bold war to capture Sicily from the Aragonese. At the invitation of the local nobility, tired of the uncaring rule of distant Zaragoza, Empress Zoe declared Sicily an imperial domain in defiance of Aragon's Habsburg allies. Pleased to strengthen its hold over the German empire, Berlin sent its soldiers from the north as the Byzantines occupied the Hungarian lands and marched on Wien from the south. With the Archduke of Austria humiliated and forced to withdraw, the Kingdom of Aragon was unable to dislodge Byzantine control over Sicily and the Sicilian nobles swore fealty to Constantinople. War between Brandenburg and Austria reignited over the duke of Danzig's claims over the city of Danzig itself, and Emperor Theodoros honored his father's alliance with Berlin. As had been demonstrated since the War of the Protestant League, the Austrians were unable to stand against the armies of Constantinople. Victory in the war, further strengthened the throne of Brandenburg. The return of Antioch and Aleksandreia to the Empire immediately spurred calls for the return of the other traditional seats of the Pentarchy, Jerusalem and Rome. The Mamluks, still reeling from the loss of the Nile Delta, remained relatively weak compared to the growing power of the Empire, and Theodoros was well informed of their inability to muster significant military or political resources. As soon as he could consolidate the financial backing for an extensive campaign, Emperor Theodoros sent his commanders to occupy the region of Palestine and take the strategic holdings at Damascus and Al-Karak. Along with reclaiming the sacred city of Jerusalem for Christianity for the first time since Salah ad-Din's victory over the crusader states, the Emperor was able to annex the coastline from Antioch to the Nile, along with its many prosperous ports. Starting with their defeat in the War of the Protestant League, the political influence of the Papal State had waned in comparison with the northern Protestant centers of the Reformation and the growing Orthodox clergies of Constantinople and Moskva. Byzantine ambitions in Italia had been evident for over a century now, and imperial patrols already reached within a few days' march south of the Eternal City. When Theodoros ordered his generals to take the city most of the Catholic chose not to defend the Pope's worldly domain, but Wien once again committed its forces to challenge Byzantine might. The war's bloodiest engagements would take place in Hungarian and Austrian lands, familiar fields of battle for the Byzantine officers, but English troops landing in Sicily and the capture of Papal holdings ensured a significant focus in Italia as well. As in previous wars, the submission of Wien secured the inevitable victory of the Empire, and when Theodoros next entered Roma it was as the city's liege and emperor. Within a few years, the loss of Roma had irreparably undercut the authority of the Papal Curia, and its unifying influence in Europe appeared to be entirely lost. 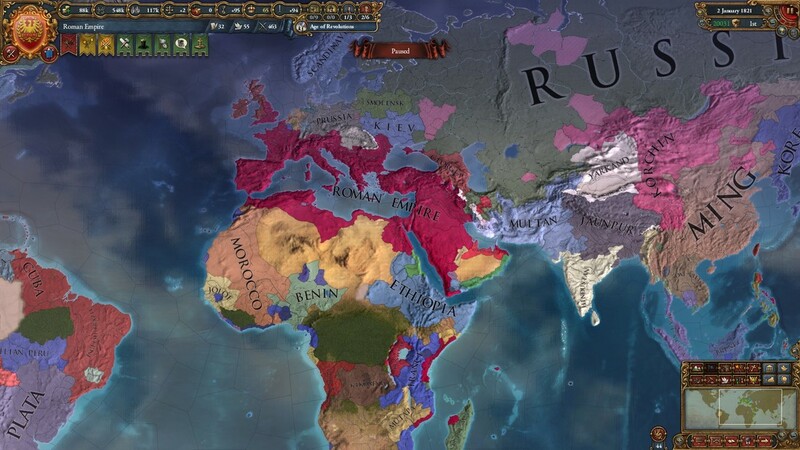 Meanwhile, the ascendant authority of the Ecumenical Patriarch in Constantinople, supported by the emperor, ensured that the increasingly diverse imperial provinces were held together by the True Faith. Though the two realms had seen each other as allies in past centuries, as each had grown in power and ceased to be threatened by foreign conquerors they had come to see each other as rivals with competing claims. To secure Constantinople's dominance over the Black Sea, Basileus Theodoros invaded the coastal regions recently annexed by the Russian Tsar and defeated the Russian army in a series of battles around the Kievan Marches. The death of Basileus Theodoros's son had left his young cousin, Helene, adopted into the imperial family, as his only heir. Her rise to the throne was far from unchallenged and her legitimacy was questions at every turn. The widowed Basilissa held control of the regency council until her ward could come of age. A growing movement of opportunistic nobles, sensing weakness in Helene's administration, organized a widespread revolt in eastern Anatolia under the flag of Nikephoros Syropoulous, a distant claimant to the throne. The supporters of Nikephoros later discovered their choice to be unwise as his ability to lead proved lacking and the revolt was swiftly crushed. Basilissa Helene desired to extend Constantinople's influence over the Mediterranean and push the Aragonese from its western waters. Though Aragon and its allies rivaled Byzantine strength on land and water, Helene's advisers suggested that the English would be unlikely to commit their forces so far from their own holdings and that the Saxons would gladly assist in subduing the Austrians. The war transpired accordingly, allowing the Byzantine commanders to annex the Venetian harbors and the island of Sardinia, and bring Tunis back under imperial control by expand the domain of the Sicilian duchy to North Africa. The systematic centralization of power started by Basileus Theodoros IV and continued by Basilissa Helene met organized resistance during her reign that led to a decade of instability across the empire. The Basilissa led an even handed response against these movements, granting concessions in some cases while violently enforcing her demands in others, but never allowed centralized power to slip far from her hands. Eventually, the new form of the imperial government appeared inevitable to all and organized resistance from the dispossessed regional powers dissipated. Their defeat paved the way for further authority to be consolidated within the imperial throne. The Basilissa chose to intervene in a conflict between the duchies of Mantua and Ferrara in order to prevent either of their rulers from consolidating substantial power in the Adriatic trade region. The war allowed Basilissa Helene to annex much more of the Papal State and, in recognition of his own need for protection, the vassalage of the duke of Ferrara. The duke Mantua, his alliance defeated by the Byzantines, followed suit soon after and joined his former rival as subject to Constantinople. Long desired by her predecessor, Basilissa Helene completed the reconquest of Egypt, removing Mamluk forces from all the lands of the Nile and bringing imperial frontiers up to the lands of the Ethiopians. While the Mamluks still controlled Arabia, they were weak and politically isolated with the Byzantines to their west and the Timurid empire to their east. War between the Catholics of Wien and the Protestants of Berlin had begun again and progressed in favor of the Austrians and their many allies. Wary of growing Austrian strength on their norther borders, Basilissa Helene order her commanders to take this opportunity to invade Austrian Venetia. As the Archduke of Austria repositioned his armies to his southern borders, the Byzantine commanders consistently defeated all attempts to repulse their advance. Simultaneously the Basilissa's son and heir, Prince Manuel, led an army that captured the Aragonese North African coast. As Manuel's forces blockaded the Iberian coast and besieged Valencia, the Aragonese agreed to relinquish Tripolitania to imperial authority. Austria's other allies bowed out after a few years, preferring to concentrate on more personal conflict, and eventually Wien was left at the Basilissa's mercy. By the time the Byzantines withdrew from the city, Venetia and Carniola were annexed and all of the Transylvanian lands had become a new provincial duchy of the imperial crown. Unfortunately, during the siege of Milan in the final year of the war, Prince Manuel was killed in the field. Manuel's young son, Alexios, thus became the heir to the imperial throne. With control over production and trade along the Nile and open access to the Red Sea, Byzantine merchants sought further influence over African and Indian trade goods. The harborage at Muscat had been proposed as an imperial base for some decades, but neither Helene, nor Theodoros IV before her had wanted to provoke war with the Timurids who saw themselves as protectors of the Omani at the time. Now, relations between the Timurids and Omani had grown cold, and Basilissa Helene approved an invasion of the Omani coast. Though Byzantine forces in the Red Sea and Indian Ocean were relatively small, the emirate of Oman was unable to resist the imperial expeditionary forces and had no choice but to abandon Muscat. Grandfather of Basileus Alexios and consort of Basilissa Helene, Theodoros Karouzeiates ruled for only two years in his grandson's stead. He would continue to be one of Alexios's primary advisers, ensuring the late Basilissa's ambitions over Italia were passed on to the new ruler as well as guiding the empire's first foray's into military control of the southern oceans. While the Papal State was largely defunct as a political authority, it still held an important symbolic status within the Catholic heresy. Basileus Alexios's first act from the throne was to order the removal of the Catholic Pope's independent state in northern Italy and the full annexation of his lands. However, the king of France, Castile, and Portugal, a formidable monarch with a world-spanning realm, believed himself the protector of all the Catholic faithful and joined the Pope's defense. 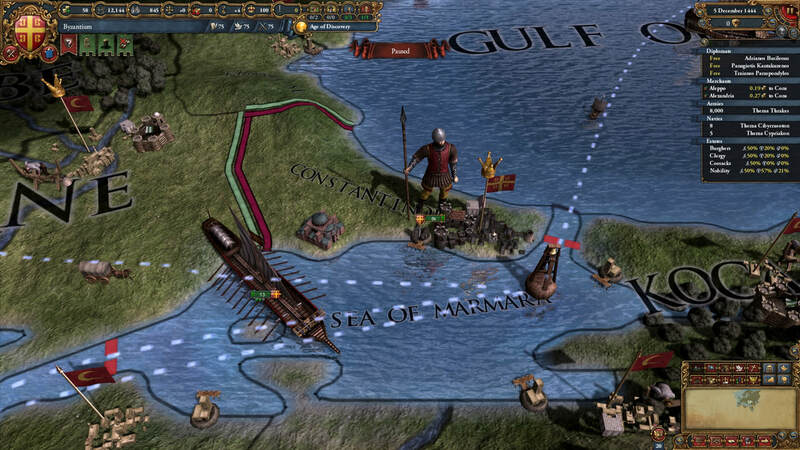 The combined Catholic fleets threatened to take command of the Mediterranean, but after a few close engagements along the Sicilian Straits, the Byzantine admirals were able to secure access to the Sea from the Atlantic and blockade the coasts of southern France and eastern Iberia. As Byzantine forces besieged Avignon and Bourgogne, the wars largest engagements occurred in Benghazi and Tripoli as the French attempted to advance into the Nile Delta. Imperial merchants and nobility, seeking to continue their expansion into the valuable lands of the southern oceans, encourage an additional expedition into French holdings along the East Africa coast, where surprisingly fierce resistance was met. A lack of overall coordination between the three Catholic kingdoms, despite their unification under one throne in Paris, seemed to prevent any further organized resistance after the Byzantine victory in North Africa, and the Catholic king ceded the ports of Zanzibar and Mombasa to Byzantine merchants in exchange for the withdrawal of troops from France. Needless to say, the Papal State was annexed and dissolved following France's acceptance of peace. Frustrated with the wealth of Asia being consolidated and taxed by the Islamic nations of the near east before reaching the Empire's borders, public opinion of the Byzantines abruptly turned against the neighboring realm of the Qara Qoyunlu. Capitalizing on strife between the Qara Qoyunlu and the Timurids, Basileus Alexios adeptly invaded Mesopotamia and quickly secured the region as new imperial province after a swift campaign through the Persian mountains. Though Mesopotamia would be ruled autonomously from Bagdad in order to control unrest and ensure efficient management of resources, the province would funnel the region's Asian trade toward Constantinople. With Italia's full return to the Empire in sight, public support for the invasion of Lombardy was palpable and there was widespread confidence in the empire's military dominance over its neighboring rivals. With this momentum, Basileus Alexios ordered the occupation of Milan, despite Austria's alliance against Byzantine expansion. In the first months of the war, the primary campaign forces along the Austrian border suffered a significant defeat from the combined might of the enemy alliance that set back the initial hopes of Alexios and his commanders, but a shift to more conservative tactics turned the war back in the Empire's favor. A quick invasion of Danzig secured their withdrawal from their war, and a long siege of Valencia later removed the Aragonese, both with territorial concessions to the empire. Unable to withstand the focused assault of the Byzantine armies, the Austrians ceded their remaining Italian holdings, and Alexios instated an autonomous Orthodox duke in Milan to govern the province. Basileus Alexios immediately expanded the Milanese duchy's borders to the Ligurian coast, annexing Genoa and Cremona, but he underestimated the resolve of the emperor in Berlin to protect the most southern princes of his empire. The one-sided conflict in northern Italia evolved into years of battles across all the northern borders of the empire with extensive losses on all sides. An invasion of the Empire's former allies heartlands, culminating in the seizure of Berlin, finally brought the rival emperor to Basileus Alexios's terms, allowing him to substantially weaken the rival emperor to the benefit of his neighbors and secure Milan's expanded realm. Due to lamentable inefficiencies in the central administration of Constantinople, Basileus Alexios continued to follow a policy of expanded influence through proxies. By force, Alexios expanded the boarders of Mesopotamia to the Persian Gulf in order to augment the empire's growing grasp on the sea trade of the southern oceans. The emir of Mushasha, who claimed the Mesopotamian delta, had only recently arisen from the crumbling realm of the Qara Qoyunlu, and was unable to resist the Byzantine forces. The war also led to the capture of the spice market routes through Sana'a, taken from the emir of Mikhlaf. While the Holy Roman Empire became less of a rival to Constantinople over time, the unified kingdoms of France, Castile, and Portugal were quickly outpacing the Greek empire with their world-spanning colonial reach. With their forces spread to the corners of the earth, however, Basileus Ioannes's commanders believed they could be beaten in a direct confrontation. Unwilling to watch his empire be eclipsed, Ioannes decided to act on the idea and invaded southern France. Years of fighting followed, and the French alliance proved dominant in North and East Africa, but they could not stop the Byzantine push into central France and the capture of Paris. Basileus Ioannes demanded the annexation of the southern Occitan coast. Helene II's reign began with an unsure start, as the sudden death of her brother had come less than a year before the death of her father. Her first years on the throne were shepherded by her mother and regent, Beatrice Theodoli, who ruled as regent for the entirety of the Alpine wars against the Austrians and maintained the absolute authority of Constantinople over its growing empire. While Byzantine control over the Mediterranean Sea was now secure, with the French presence waning over the past half-century, Constanintople's route into Europe's interior were still impeded by Wien's Alpine fortresses. The campaign to seize this strategically valuable sites was extensive but vital to the empire's continued dominance over its European rivals. The kingdom of Aragon, reliable ally of Wien, was forced to relinquish further provinces of their maritime realm in compensation for their continuing support of the Austrians. While the relationship between the Empire and the kingdom of the Ethiopians had fluctuated over the centuries, violence between the two realms had been rare. However, this state was disturbed by growing ties between the Ethiopian and French monarchies, and Basilissa Helene's advisers searched for a way to disrupt this new alliance. Many of the lucrative trade ports that fed into the Gulf of Aden were protected by the Ethiopian kingdom in one way or another, and targeting one of these small states allowed the Basilissa to force Ethiopia to stand against the Empire or submit to its authority in the region. Ethiopia chose to confront the Byzantine military and suffered humiliating defeats on all fronts. Mogadishu became an imperial port and the Ethiopians abandoned their attempts to expand their influence by meddling in Constantinople's rivalries. With relations secure along the southern and eastern borders of the Empire, Basilissa Helene commanded her generals to go on the offensive against the French kingdoms and the allied duchy of Savoy. Helene's noble council had fomented popular support for a campaign in southern Iberia to reclaim the provinces of Hispania as the great Basileus Justinian had once done, and though Helene thought it wiser to focus on her rival's power centers in Aquitaine, seizing Upper Andalucia was important to controlling access to the Mediterranean and give the Empire convenient ports for Atlantic expeditions. Unfortunately, the French kingdoms and the German Emperor had overcome their differences momentarily to unite against Constantinople's reconstruction of the ancient empire of the Romans. Though this greatly complicated the logistical strategy of the ensuing war, Basilissa He Helene overcame both of her western rivals and annexed Iberia's southern coast as far west as the Pillars of Heracles. Though the Mamluks had been politically sidelined for many decades, they still controlled a the vast Arabian deserts and blocked the land routes between Aegyptos, Mesopotamia, Sana'a, and Muscat. At the Basilissa's direction, the Empire moved into the desert cities to force the Mamluks out, and this was quickly accomplished. Intervention by the Mamluk's Sunni allies in India protracted the war for a few years, but the outcome never appeared as anything but inevitable. The alliance networks of the Holy Roman Empire, and its rival claim to Roma's heritage had frustrated Constantinople's monarchs for close to a thousand years, but the fragility of this idea in the collective German mind was palpable at the present. Seeing the opportunity, Basilissa determined that she would shatter this notion once and for all and rid the world of the false Romans. The Byzantine commanders advanced once more into Austria and captured Wien with no intent to leave. Helene's armies defeated a united resistance of Austrians, Brandenburgers, Mecklenburgers, and Hessians, as well as many of the smaller German states, and the Byzantine forces occupied Berlin, Hamburg, Holland, and Liege, capturing almost all prestigious seats of Germanic power. With most of the German electors held as guests by the Basilissa or fled to foreign lands, abandoning their people, Helene forced the German monarchs to dismantle the Holy Roman Empire and publicly renounce all claims that attended its various titles. Byzantine scholars and historians had often wondered if the Palaiologi, the dynasty that had brought the Greek empire back from its own ashes and suitable taken the Purple Phoenix as its arms, was destined to rule the realm forever. Of course all things must end, however, and it became clear as Helene's rule progressed that she would not bear another heir after the early death of her one son. Helene did not have many close living relatives either, as her parents and grandparents had also had precious few offspring. At her death, the crown passed to distant kin in the well-respected Spartenos dynasty and civil war was avoided, though their legitimacy would be questioned in the years to come. As rulers throughout history had done before him, he chose to rally the support of his subjects by directing their apprehensions and fear against a foreign threat and the Emperor of France, continuing to stand against the resurgent Roman empire, easily fulfilled this role for the first Spartenos basileus. Consolidating the imperial armies, he thrust the themes once more into the Occitan lands to further expand Constantinople's rule over the former Gallic provinces. No grand alliance stood with the French this time and Basileus Markos secured his popularity by carving out the duchy of Gascony, vassal of the imperial throne, but ruled by sympathetic local nobility from Bordeaux. The hold of the Spartenos dynasty on the imperial throne was tested after the death of Basileus Markos II. Markos's heir, Andronikos, was still quite young when ascended to the throne, making him a vulnerable target of court intrigue, but his mother, Theodora, was successful in maintaining the authority of her regency and suppressing the growth of factions that supported the Rhangabe pretenders. Theodora Lykaon followed up on her husbands victories against the French, by capturing the valuable lands of Bourgogne. The weakened French Empire, humiliated by a chain of defeats at the hands of the Byzantines over the past century, was now further crippled by rebellions in their most lucrative and powerful overseas colonies. As the French Empire began to disintegrate, it appeared that the reconquest of all the Gallic province was in reach. Either believing further support would appear across the empire under his banner, or feeling forced to action by the enclosing grip of the Spartenos loyalists, Ioulianos Rhangabe launched a rebellion in the Byzantine heartlands that survived for many years due to the throne's focus on military efforts in France and Iberia. He failed to rather further support during this period however and made no progress beyond his own domains around Smyrna. He was eventually crushed and imprisoned. Having captured ports on the coast of Picardy with which to safely dock the imperial fleets, Basileus Andronikos launched an ambitious invasion Great Britain in order to recapture the furthest reaches of the Roman Empire. The kingdom of Aragon, aware of their own impending annexation, fatalistically joined the British in war against the Empire, but were soundly defeated, their monarchy dethroned, and Valencia annexed into the province of Hispania. The famed British fleets were outnumbered and defeated by Andronikos's admirals, and London was captured soon after a landing was secured in Kent. The British won a major battle in the western Marches following London's fall, but were soon overrun the after imperial forces regrouped and renewed their advance towards on York and Lothain. The French Empire had lost most of their Iberian domains to separatist rebellions, but still held on to power centers in Cordoba and some surrounding provinces. Byzantine commanders easily occupied these isolated fortresses once Basileus Andronikos gave the order, finally terminating the long history of French rule in Iberia. ​The separatist states of Portugal and Castile, were soon integrated into the Empire after their violent emergence from French rule. Though their subjugation was forced at the point of the bayonet, the population of Hispania was soon a vital and prosperous part of the resurgent empire of the Romans. Basileus Andronikos VI did not survive to see the final conquest of western Europe, but his son and heir had been an integral member of his council and prioritized the completion of his father's goals. Paris, occupied many times over the years by imperial forces, was captured one last time along with the French Emperor. For his release and freedom to rule his Wallonian holdings, the monarch was forced to cede Paris and the realms of Maine, Brittany, and Normandy. With the empires rapid expansion in western Europe, increasing amounts of the imperial bureaucracy was being centralized in Roma instead of Constantinople for logistical purposes and to capitalize on the Genoese trade routes that reached from Aegyptos to the New World. 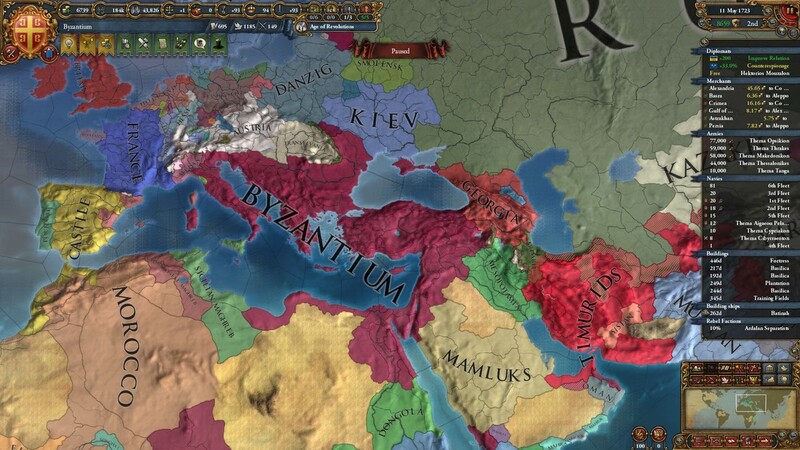 In an ironic juxtaposition of his namesake, Basileus Konstantinos recognized these changes and organized a great triumph to take place in Roma as he decided to reconsecrate the ancient city as the Empire's official capital. While Constantinople would continue to rival Roma's glory, the Roman throne would return to its original home and the Roman Senate would be reinstated to serve the empire's people, working in cooperation with the Roman Imperator to bring the Empire to further glory.